London underground tube map. London underground map (England) to print. London underground map (England) to download. Although the metro is the most used means of transportation for tourists and visitors to London, Tube stations close to major tourist attractions are only a short walk from each other. If Londoners are well aware, this is not always the case for tourists. The London Underground is the best way to discover the city. London Underground (The Tube) exists since 1863, it is the oldest of the world (150 years in 2013). The London Underground is very expensive compared to other European capitals. Chances are that the vast majority of your trips will be in Zone 1 and Zone 2. 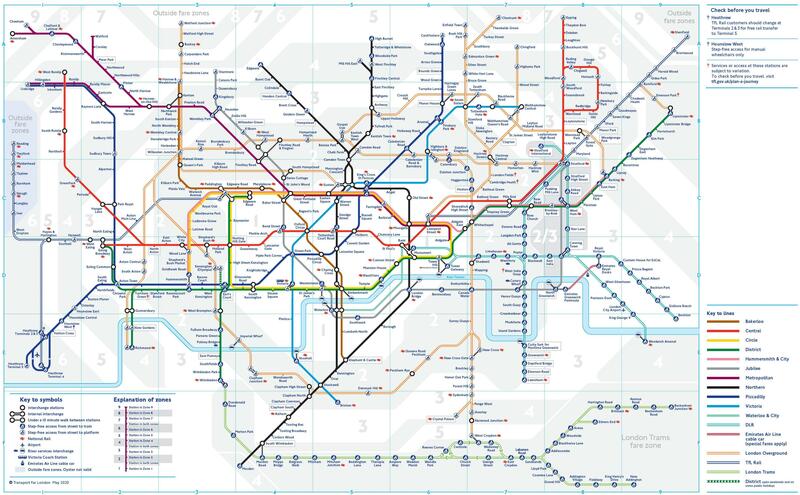 Beyond these areas, prices are high and the London Underground becomes very expensive. Arrived at the London Metro station, get a map (available for free at the stations). Locate your departure station and destination. After that, follow the lines of colors (there are 11 subway lines in London) - refer to the legend to know the name, it's easier - and note which intersections you need to change lines. With the Oyster card you no longer need to predict how many London subway tickets to buy. You recharge it with a subscription to the day or the week. This allows you to be more flexible. If your metro trip is between multiple zones, check rates and discounts for all areas. Moving with The Tube can be expensive.